Aristotle speaks about an unmoved mover. He claims that there are about forty-nine unmoved entities that are in a state of pure actuality. Although they themselves do not move, they do not cause motion in others. Like a magnet, they move other beings by attraction. The presence of entelechy, the self-actualizing fulfillment of a thing's distinctive nature, is what drives motion to completion. Through entelechy, something in a potential state achieves its active or actual state. For example, a seed from a tree is a potential tree. When it falls to the ground and finds conditions appropriate for growth, it sprouts and becomes an actual tree. While it is still a potential tree it has not yet been perfected, because its inherent entelechy has not completed the course of its development. For a seed, perfection is attained when it becomes a tree. But according to Aristotle, there are also unmoved movers that do not possess this inherent potential, but are in a state of pure actuality or are completely active by nature. He maintains that they were always in existence, that they will always exist, and that they move all things by attraction. Whatever undergoes this transformation from a potential state to an actualized state progresses towards its perfection, and the attractive force that guides it towards this perfection originates in the unmoved movers. That is Aristotle's teaching in a few words. Now we encounter the same ideas on this topic in the Neoplatonists that we encounter in Aristotle. Plato, on the other hand, did not deal with this subject as far as we know. 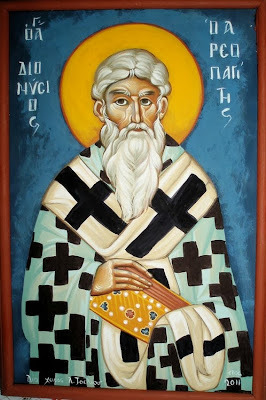 But when we turn to the Church Fathers, we encounter a certain St. Dionysios the Areopagite who is accused of Platonizing and Neoplatonizing, even though he clearly tells us that God is not solely an unmoved mover. He is also moved. There is in God an aspect that is capable of suffering or undergoing change. Naturally, St. Dionysios is writing this in opposition to Aristotle and the Neoplatonists. But it is also irrefutable proof that St. Dionysios the Areopagite was by no means in league with Neoplatonists, even though he used their language. The suggestion that God is not only an unmoved mover, but also moved, is heresy to Neoplatonists and Aristotelians. It is an idea that does not withstand the test of reason and that consequently indicates that the Fathers did not practice philosophy. When the Fathers say that God is both an unmoved mover and also moved, they show us that we cannot apply any human categories to God. If we do try to apply them, then we will run into logical contradictions at every turn. This truth about God, however, is not derived from philosophy, but from the experience of theosis. By experience, the Fathers know that our concepts about God lose all value when we gaze directly at God Himself and behold that reality, which is none other than God Himself. From Patristic Theology: The University Lectures of Fr. John Romanides, pp. 71-73.